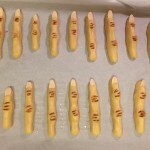 Scary Halloween “Finger” Cookies – Low Carb & Gluten Free! Make these great Low Carb & Gluten Free Halloween Finger Cookies that are sure to scare you away from those other sugar-filled snack options! Chill LC-Gluten Free Cookie Base Mix® bag prior to use. In a medium bowl, place entire bag of LC-Gluten Free Cookie Base Mix®. Add the eggs, butter, sour cream, water and mix just until combined. Grease a cookie sheet (or line with parchment paper). Wet a toothpick and dip it into the ground cinnamon. Make hash marks in the “fingers” to represent wrinkles. Place the cookie sheet on the oven’s highest rack level and bake for 12-14 minutes. Allow to cool for 5 minutes and then move to wire racks for additional cooling. Optional – Follow the package instructions to make LC Vanilla Frosting Mix® and use for spreading or dipping!